Tribal tattoos are popular with all genders because of their deep symbolic meaning and usage of black ink. When choosing tribal spine tattoos go for large designs that will improve the visual appeal of your back. Flower tattoos are often associated with feminity and delicateness, features that most women can relate to. For the spinal cord, you can ink any flower that best portrays your personality. You also have the option to go for a black only design or colored flower. 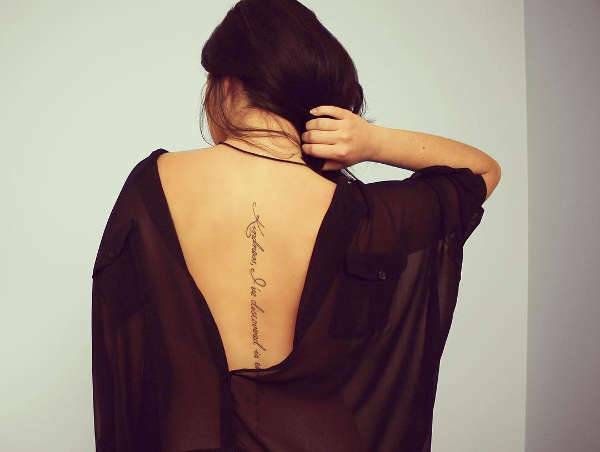 Spine tattoo designs for ladies should showcase their feminity without taking away the meaning. While flowers tattoos are great, you can go in a different direction and opt for a quote, an arrow, a name or Chinese letters. 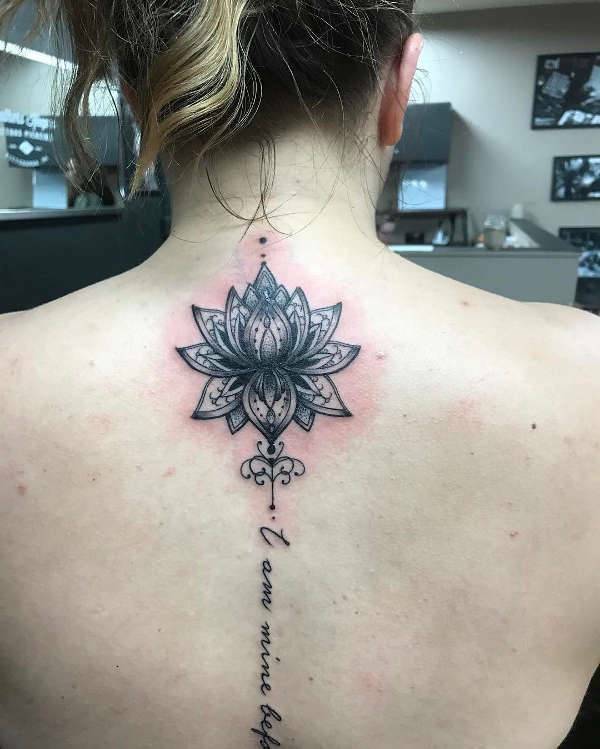 Whether from Hinduism, Buddhism or Christianity perspective, mandala tattoos are popular because of their spiritual meanings like balance, wholeness, harmony and eternity. Some people even choose them for their beauty. 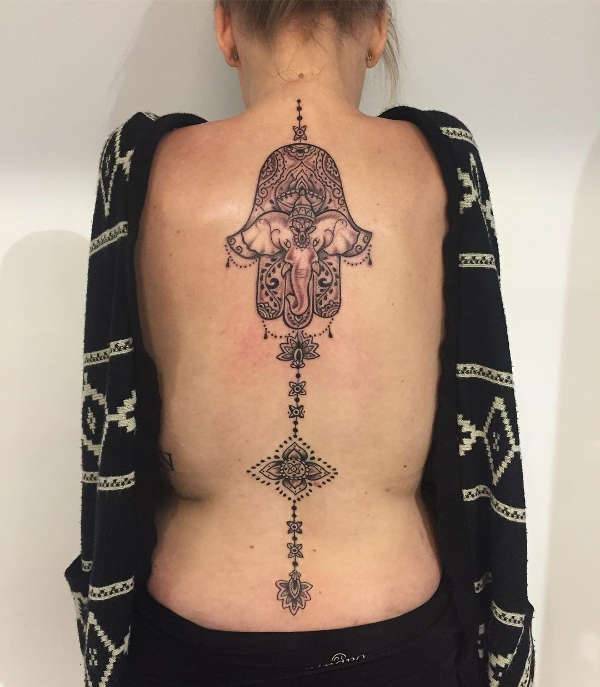 Inking an elephant with a mandala tattoo will clearly show your religious stand. 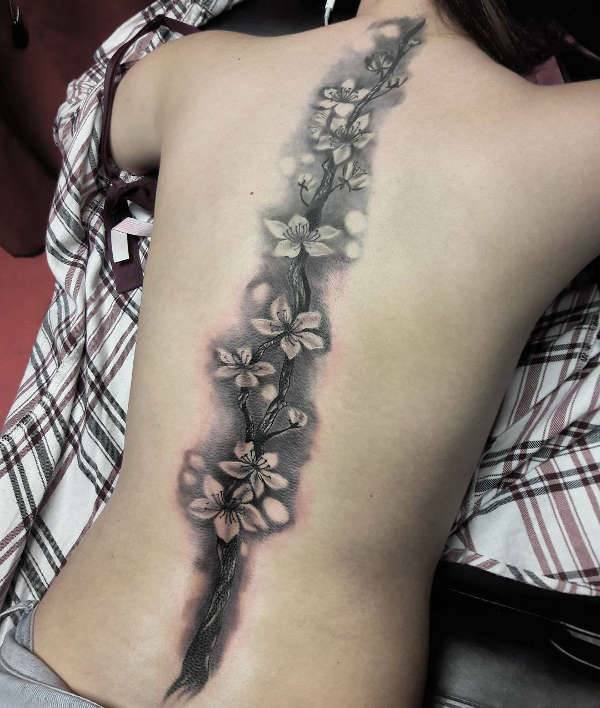 The vertical nature of vines makes them perfect as spine tattoos. While a cherry blossom will look stunning on anyone’s back, you can still opt for other floral vines such as bougainvillea, morning glory or any other colored flower vine. If you get your body art inspiration comes from celebrities, then check out the star tattoos inked by Rihanna and Ruby Rose. 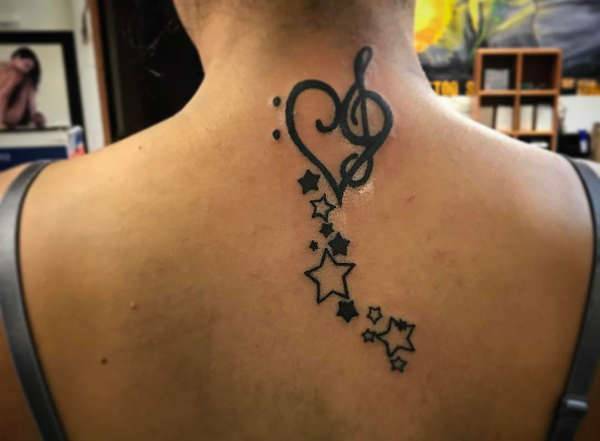 To make your spine star tattoo unique add another design like a heart and place it on the upper part of the spine. 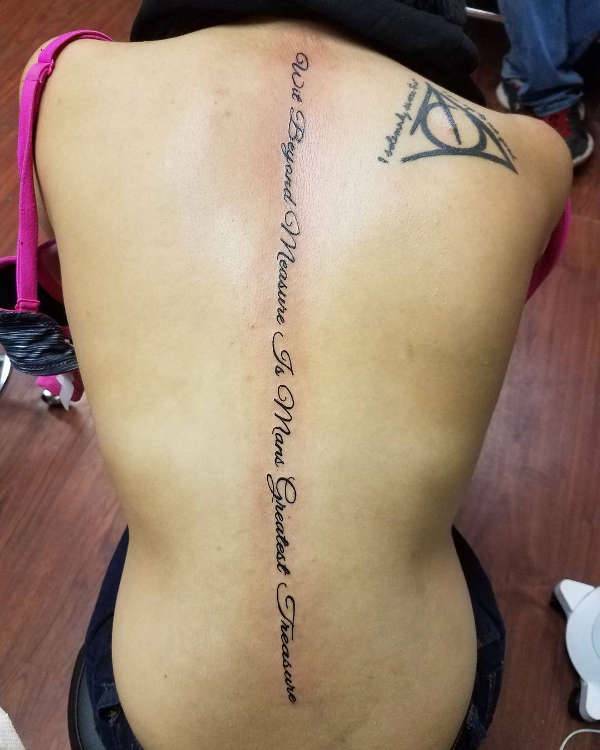 Words have the ability to change or inspire people, and that is one of the primary reason why both men and women get quote tattoos. 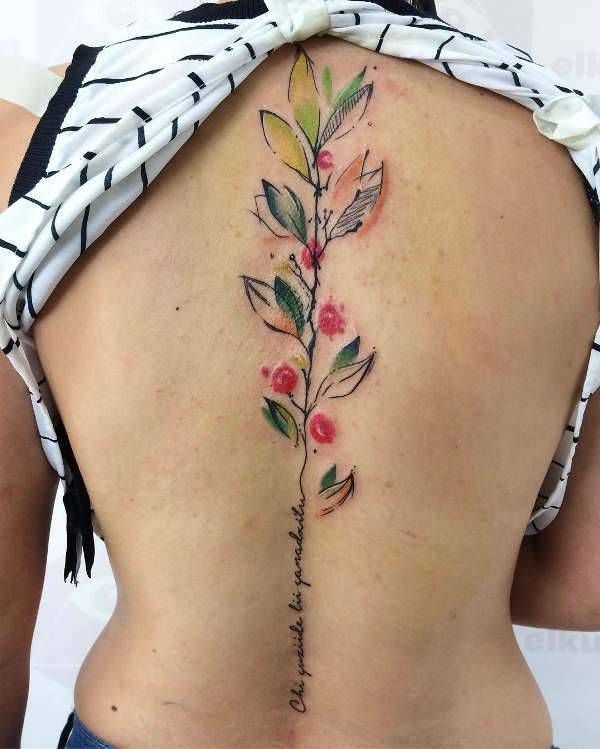 For spine tattoos, you can opt for inspirational words or quotes about life, religion or fashion. A butterfly starts out as a moth-like a creature and grows to become a beautiful insect. 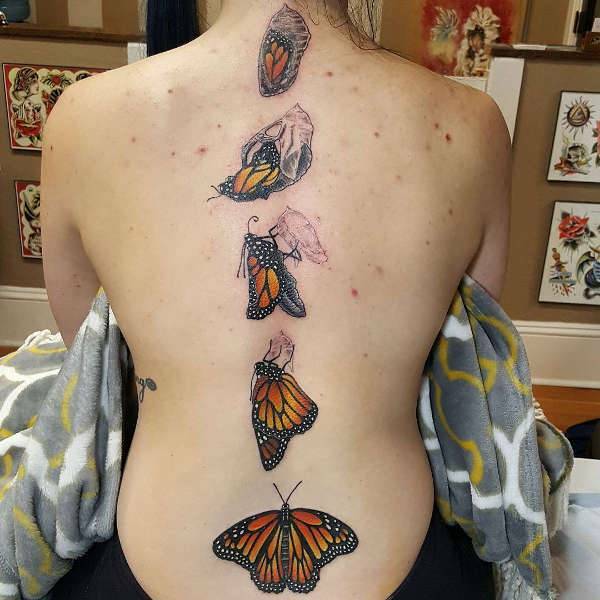 You can use a spine tattoo to tell the life cycle of a butterfly or to depict transformation. Viking tattoos show medieval history and carry symbolic meanings like courage, victory, and rebirth. Most are usually done in black color but still showcase intricate designs that depict Viking heritage. 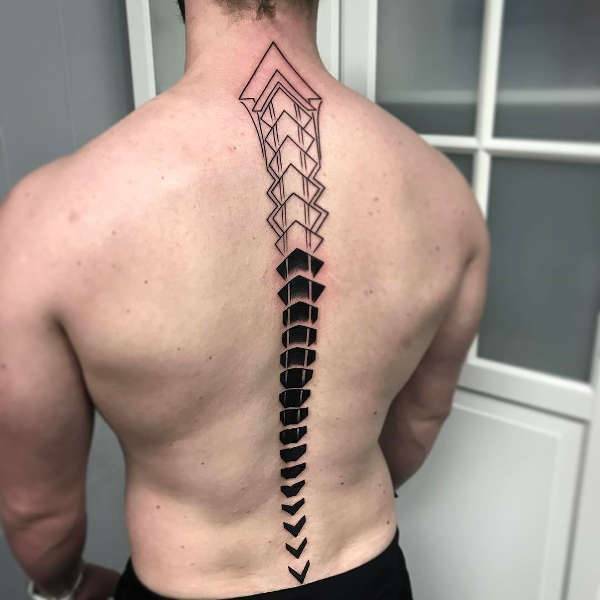 For spine tattoo for men, you can draw a sword or Thor’s hammer. 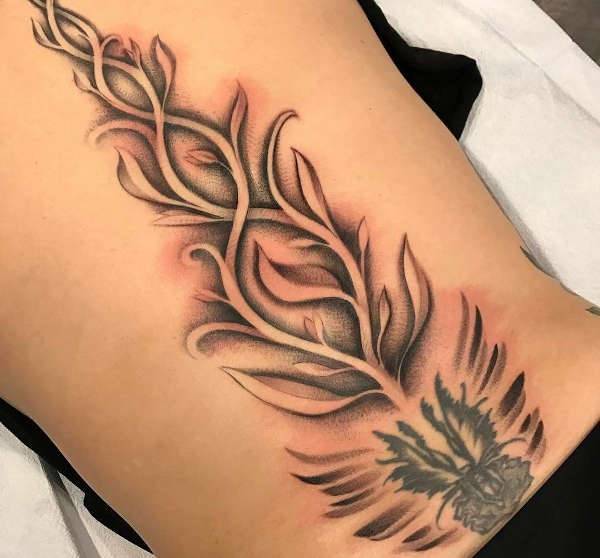 Placement of spine tattoos gives you the advantage of showing it only when you want to, like at the beach and covering it up quickly when attending school or other formal events. You are also not limited by space, and you can even draw tribal tattoos of any size.